The Missouri Coalition for the Environment now steps into this niche, coordinating a new St. Louis regional Food Policy Coalition, thanks to a multi-year grant from the Missouri Foundation For Health. Melissa Vatterott - MCE's Food & Farm Coordinator - talks with Earthworms' host Jean Ponzi about the issues and opportunities she and her growing circle of partners are digging into, around the St. Louis Regional "Foodshed." Food is the one environmental "issue" that can touch every human heart, engaging us in needed awareness and changes through stuff we all ENJOY and LOVE. Food Policy? Fork it over! And stay tuned to learn more, as these efforts grow. Global media of all stripes ably covered the recent COP21 Climate Summit in Paris. Earthworms contributes our part with this conversation with Dr. Jan Salick, Senior Curator at the Missouri Botanical Garden, who was invited by UNESCO to present at Indigenous Peoples and Climate Change, a pre-conference event in association with the Climate Summit. Jan Salick has studied and learned from indigenous peoples for decades, in her work as an ethnobotanist for the Garden. Her focus is the cultural relationships between plants and human beings. She hosted the first international symposium on indigenous people and climate change, in 2007, at the Environmental Change Institute of Oxford University. Her knowledge and, most importantly, her perspective is deeply rooted. From her years climbing around the Himalayas, and her current work on flatter ground on Cape Cod, Jan Salick is an articulate voice for the delicate balance both plants and indigenous people must maintain to survive the human-generated impacts on Earth's climate. As you can hear, a week or so after Jan's "life-changing experiences" in Paris during the climate events, she remains optimistic that people - like plants - can adapt, and that our species can make changes, to reduce our collective impacts. Personal, hopeful, and informed by experience: this report amid many from the landmark meeting of 196 nations, that actually reached an agreement needed to guide our species' work - of which there is no bloomin' lack! St. Louisan David Henry was fed up, back in 2013, with public indifference to climate change, and denial of the science defining climate issues. He wanted to shake his fellow humans by the scruff of the neck or, as he says, "at least figure out how they became such idiots." David is a gentle, calm, thoughtful guy; really not a scruff-shaker. But he does care passionately about dealing with this key problem of our time. So he embarked on a one-man climate action: walking - over 1,000 miles - and having conversations with people he met, about climate change. A vivid feature of this trip was the cart he rigged to carry his stuff. 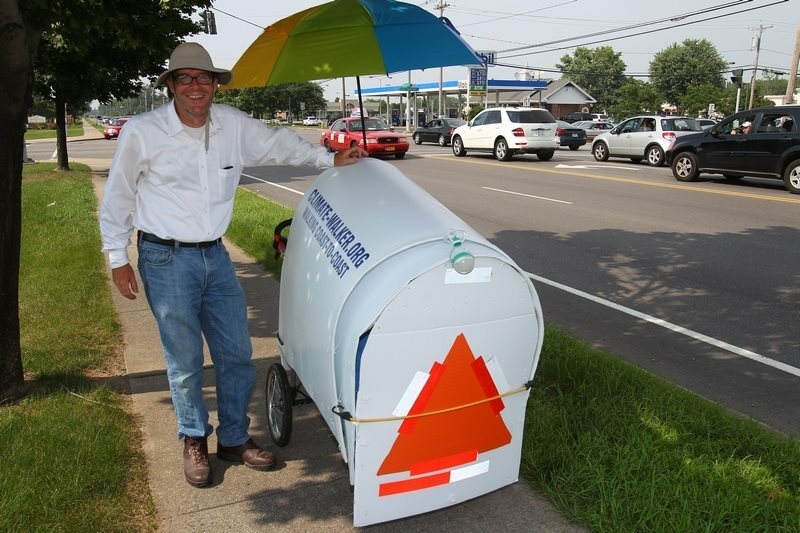 It looked, inadvertently, like a giant white mailbox, with his Climate-Walker.org identity emblazoned on the side. This climate messenger had no trouble starting conversations! David's climate of frustration has turned into a hopeful perspective, a resource we can sure use. And his determination to get us climate-dependent humans to ACT has not changed. Music: Audrey's Bounce, performed by Western Satellites in the studios of KDHX. Chemistry is a fact of Earth Life, not a problem in itself. The increasingly persistent hitch is with the thousands of synthetic chemicals routinely used in making clothing, cosmetics, household products, electronic devices - even children's toys - and the toxic chemical soup in which we are all increasingly steeped. Ken Geiser's new book, Chemicals Without Harm - Policies for a Sustainable World (2015, MIT Press), details issues associated with today's largely unregulated chemical use in all areas of manufacturing, especially in the U.S. More importantly, he lays out examples of policies and practices by which the chemical industry itself is moving toward a 21st Century "green chemistry" ethic. Emphasis: the power of consumer awareness and purchasing choices to drive policy and practice changes! Ken Geiser speaks and writes from depth of experience, as Professor Emeritus of Work Environment at the University of Massachusettes Lowell, founder of the Lowell Center for Sustainable Production, and as a Fellow of the U S Green Building Council, addressing Healthy Materials. He describes needed shifts in strategy, away from merely trying to control levels of exposure through regulation, and toward developing and adopting alternatives to hazardous chemicals, by applying sustainable values and design. The Good Guide - Provides reviews of over 250,000 consumer products, based on scientific ratings; includes app for evaluating product choices on the go! Catch Earthworms' October 2014 conversation with Good Guide's chief scientist Bill Pease. Skin Deep - Cosmetics database evaluated by Environmental Working Group. Women's Voices for the Earth - Non-profit research and advocacy group, specifically focused on products affecting women's health. The Ecology Center of Ann Arbor, Michigan - Consumer education, local services, advocacy addressing public health and safety policy. Silent Spring Institute - Partnership of scientists and citizens concerned about environmental links to breast cancer. Canadian biologist Jessica Ernst worked in the oil and gas industry. When her well water became a flammable stew, she embarked on a fact-finding and legal campaign, now into a second decade, that's about to go to the Supreme Court. Her opponents: corporate fossil fuel giant Encana, the agency Alberta Environment, and the Energy Resources Conservation Board. At issue: just oversight of public resources (water!) and the accountability of both government and industry. Earthworms podcast guest Andrew Nikiforuk tells this complex story in his new book Slick Water: Fracking and One Insider's Stand Against the World's Most Powerful Industry (2015, Greystone Books, published in partnership with the David Suzuki Foundation). Nikiforuk, a Canadian journalist, is a recipient of the prestigious Rachel Carson Environmental Book Award. He weaves a compelling report of Jessica Ernst's research and extraordinary citizen activism with the science of fracking and its wake of human and environmental repercussions. The book is a page-turner. This conversation is an intelligent, compelling must-hear. Music: Public Enemy Number One, recorded at KDHX by the Godfathers.